Our hearts sank when there was a thunderstorm just before we set off, but it stopped before we got there, and the night was warm and balmy. Bob talked a bit about bats and bat detectors while we waited for it to begin to get dark. While we were waiting we had several bat boxes pointed out to us and Bob heard himself volunteer to help with the checking and, before he knew it, advising where other boxes might be put. We also established that we could get the key to the outbuildings hat were known once to contain bats. We paused to talk to two fishermen who spend long hours at the lake side., and were well aware of just how many bats there were around. One of him left his rod after a while and came and joined us. The bats were fashionably late arriving, but put on an impressive show. 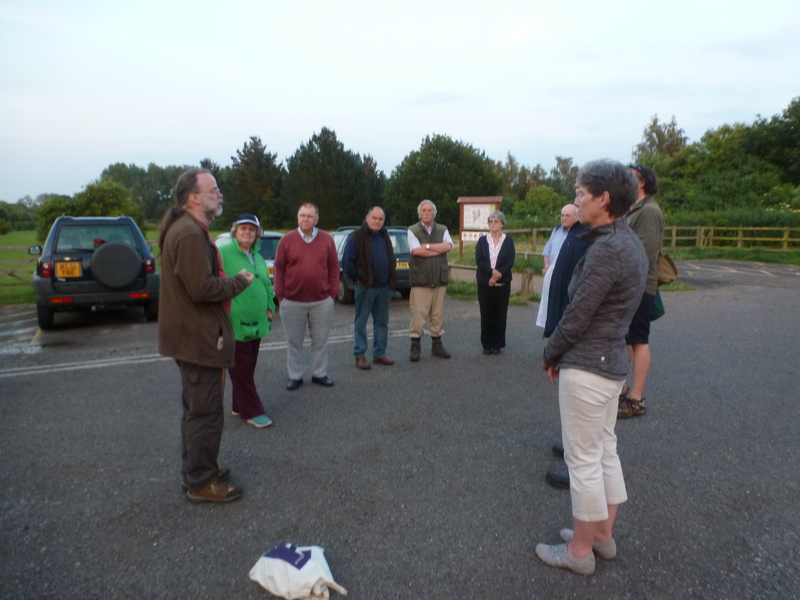 Folks were astounded at the noisiness of the Noctules, the chirpy flight of the pipistrelles and ere able to tell the difference between the two types. Later on in the evening the Daubenton’s put in an appearance. Because it was still quite light they stayed close to the willows at the water’s edge so really good sitings were few and far between. Folk were late to leave and were rewarded with serotines calling as we made our way back to the cars. It was great fun spending time with some real enthusiasts. By the time we left a heavy mist had descended and we had the bonus of watching a kamikazi roe deer step out in front of us and stalk across the road totally ignoring us. A little later a muntjac tried the same, but on seeing us , darted back for cover. This entry was posted in Uncategorized and tagged Daubenton's, noctule, pipistrelles, serotine, Tiddenfoot Water Park, walk. Bookmark the permalink.